A jeweler’s bench is a fascinating place. Full of tiny tools, glittering with odds and ends, and strewn with precious gems, it’s a miniature wonderland for makers of intricate objects. But perched next to this organized chaos are some surprising new additions to modern creation. High-definition monitors attached to laptop computers sit beside sleek 3D printers, both flashing with almost as much color and movement as the pieces coming alive on the bench. In an industry founded on quality and craftsmanship, jewelers and their customers often ask what role the latest, most advanced technologies can play in creating beautiful and wearable works of art. Here’s a brief look inside how workshops, casting houses, and retail stores are using computer-aided design and manufacturing (CAD/CAM) to enhance the design, production, and sale of quality jewelry. New designers are learning CAD/CAM in the classroom and coming to work better prepared to hit the ground running as effective team members. More thorough training means less learning time on the job, and the next wave of young bench jewelers and designers will have the skills to lead the way in jewelry creation. Formlabs' PreForm software prepares CAD/CAM models for 3D printing by orienting them properly and automatically generating support structures. The Rhode Island School of Design (RISD) offers programs for learning CAD/CAM techniques in jewelry, fine art, and modelmaking, and many other related areas. Students are taught the foundations of traditional design along with computer rendering. The learning process continues with casting, polishing, and gem-setting techniques. In moving beyond the theoretical concepts and into physical production, students are taught the skills required for their future employment as designers, bench jewelers, and artists. A new MJSA initiative entitled BEaJEWELER has recently emerged to provide awareness about the various careers available in the industry, as well as access to design and bench technique education. Through this evolving website, new jewelers can connect with current industry members and learn about educational opportunities and other degree and certification programs that serve to train the next generation of creators. In response to the demand for beautiful custom jewelry and superior consumer experience, designers use 3D printing to bring back the tactile experience of choosing a special piece. Rather than gazing at a colorful computer render and hoping the final product fits like a dream, clients can now try on a prototype of a custom engagement ring they helped design to make sure it looks and feels exactly right before final piece is produced. Unlike hand-carved waxes and some other wax-based printed materials, pieces printed in prototyping resin (such as Formlabs Grey Resin) are both finely detailed and tough enough to resist breakage when handled by clients and staff. Adding this step to the process creates a more tangible experience that feels comfortable and interactive. Designers can reduce lengthy outsourcing turnaround by prototyping their pieces in-house, checking for style and accuracy before printing the final model and casting in their metal(s) of choice. With the capacity to print multiple pieces or versions of designs in just a few hours, the time from idea inception to reality can be shrunk into a single day. By finalizing every aspect of a design before it’s cast, changes to form or function can be made and tested at the cost of a few dollars’ worth of resin. Jewelry prototypes by Zina Sterling printed in Formlabs Grey Resin. While smaller-capacity designers have discovered the benefits of desktop prototyping, low-overhead online jewelers have also found the best way to serve their far-flung clients by sending them a 3D printed model in a durable, high-detail material before creating the finished product. Clients feel more connected to the designer, and no part of the process is lost in translation. Formlabs Grey Resin offers a matte, opaque finish that offers the highest surface detail of any Formlabs material to date. High contrast and high precision for beautiful prototypes. Request a sample to see for yourself. Casting houses are taking advantage of larger 3D printer build volumes and high precision to print full-capacity runs at faster speeds and lower costs than ever before. With reduced turnaround and operating costs&mdash;and almost no cost for maintenance&mdash;production becomes more efficient. Many 3D printers have historically offered build volumes just barely large enough to fit a handful of rings at a time, but as 3D printing becomes more advanced, affordable models like the Form 2 offer larger platforms. With desktop 3D printing, jewelers can prototype in-house to finalize every aspect of design before a piece is cast. Jewelers can produce multiple versions of a single piece, create larger designs like cuffs and bangles, or embrace the repeatability of 3D printing and fill the platform with a production run of an entire line&mdash;more than 50 pieces at a time, in some cases. Vulcanized rubber molds can be used to produce wax models in quantity for investment casting of metal parts such as jewelry, small industrial components, and gaming miniatures. Retailers who offer custom design already enjoy a major sales advantage, especially with tech-savvy customers and the advent of online shopping for mid-to-high-end jewelry. It’s difficult to comparison shop for a one-of-a-kind design. According to a recent selected survey by National Jeweler, retailers are embracing the growth in custom work because it offers “better margins, relationship building, and the fact that making a piece highlights what it is that makes jewelers, well, jewelers&mdash;the ability to make jewelry.” Many see custom as the gateway to future success, as satisfied clients will return to the same stores and designers with repeat business they can’t source from anywhere else. It’s now possible to generate additional value by offering a 3D printed prototype. By allowing clients to check for overall comfort and fit, stone height, and even deciding between different stone sizes and shapes, retailers can sell unique jewelry that differentiates them from competitors. Loose gems in specialty cuts or sizes, specialty items such as wraparound bands to perfectly fit against unusually-shaped rings, and designs with estate or family gemstones all benefit from a physical prototype for the customer to approve before the final decision is made. Jewelry industry innovators are beginning to expand their knowledge and skills with CAD/CAM technology in order to better serve current and future clients. 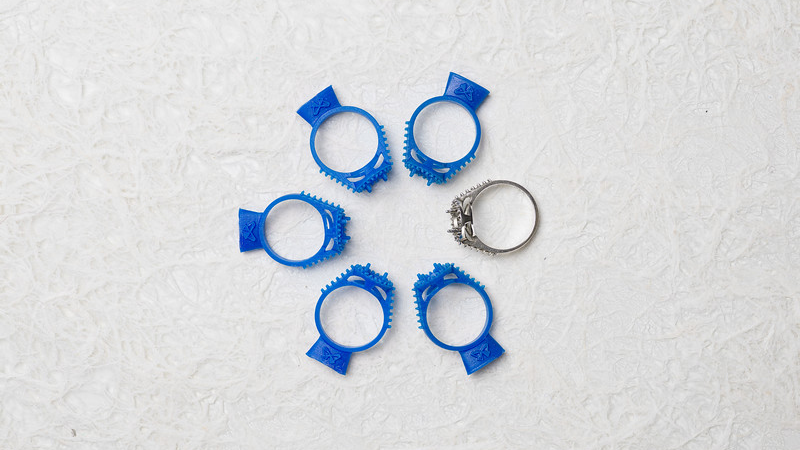 Rings printed in Formlabs Castable Resin. Download our free white paper to learn guidelines for digital design to achieve successful 3D prints and castings, plus how to successfully concept, design, orient, and support parts in the Form 2 3D printer.